Bibin-myun is Korean food, but we use sōmen instead of Korean noodle. So that it becomes Japanese style Bibin-myun. ① Split the cucumber and then cut each half into thin diagonal slices. Cut the kimchee into bite-size pieces. Julienne the nori. Cut the soft-boiled eggs in half. ② Add the sauce ingredients to a large bowl, mix well, then add the noodles. ③ Serve the noodles in bowls, doling out the liquid evenly, too. Top with the cucumber, kimchee, nori, eggs, and sesame seeds. Fill a medium-to-large-size pot mostly full with water. Bring this to a boil. 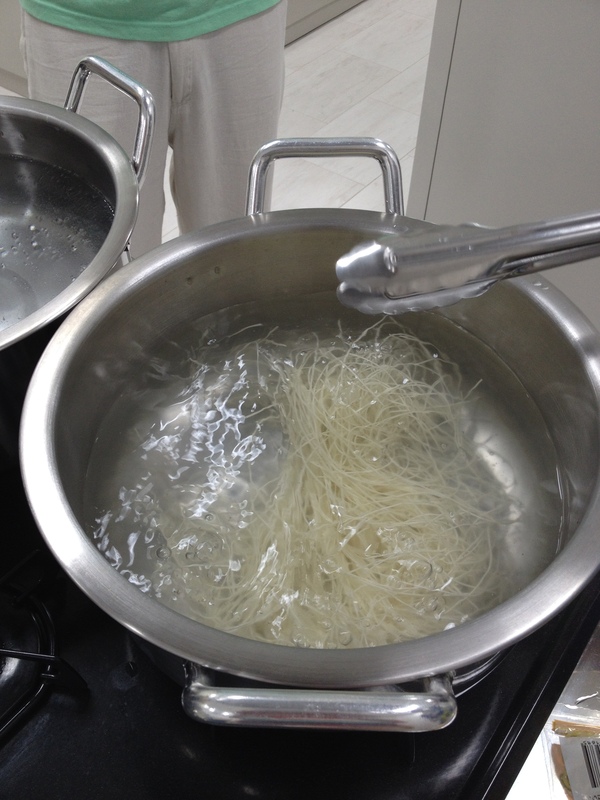 Place the sōmen noodles into the boiling water, taking care to let them spread out. Boil for 1 minute, dump the contents of the pot into a strainer and then transfer the noodles from the strainer to a mixing bowl or pot filled with cold water. Use your hands to rinse the noodles in the cold water, changing the water 2-3 times. Finally drain off the rinse water.